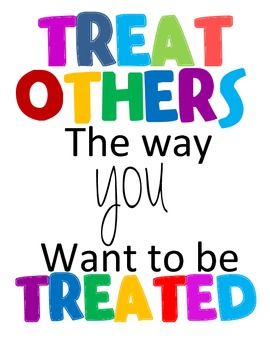 Lots of people know the Golden Rule is do unto others as you would have them do unto you. We are commanded to love everyone. That’s how JESUS lived on earth, and if we are Christians, we gotta be like HIM. How will the world know that we are Christians? JESUS didn’t say to treat people right “if only” they do something for you first. HE commanded us to love people. PERIOD. Don’t do the golden rule by your standards, do it by GOD’S standards. The greatest way to give the Love of JESUS to others is by not expecting anything in return. Treat people right even when they don’t respond that way to you. One way to treat people is to show the Love of JESUS is by sacrificing your own feelings for someone else’s feelings. When people do you wrong we shouldn’t do them wrong. We shouldn’t react the way they do to us. Maybe that person is going through some stuff in their lives. Maybe they just ain’t feeling good. Maybe we need to understand them a little better. Sometimes we need to just let things go instead of dwelling on it because that will make us angry and bitter not just to that person but it will carry on to others we don’t want to do wrong. JESUS calls us to do to others what you would have them to do you. Sometimes it’s not easy. Don’t wait for them to do something. Take the initiative. You want to be forgiven? Forgive! You feel hurt, broken and could stand a gentle touch? Be gentle with others! You want to feel loved? Love others. You enjoy a compliment? Compliment others!